I have just set up the new “Hoofbeats and Cold Steel” blog on Google Blogger (BlogSpot). The new link is here (http://jdpetruzzi.blogspot.com). Please update your links and URLs. I’ll keep this old blog up for a while as I import it into the new blog, then I’ll delete it. WordPress’ software has been rather screwed up lately, and it became very difficult to use. Blogger’s software is much better, easier to work with, and I’m happy with the new host. See you over there! I just received a note from Paul Gilbert, Executive Director of the Northern Virginia Regional Park Authority and who maintains a blog called Regional Parks. The Authority is in the process of purchasing 275 acres of land owned by Confederate Lt. Col. Elijah Viers “Lige” White where White’s Ford stands. The land is slated to be known as White’s Ford Regional Park. Prior to the Civil War, White purchased a large farm there (he was originally from Poolesville MD across the Potomac). A ford on the property became known as White’s Ford, and was used constantly by both Confederates and Federals throughout the war. Following the war, White operated a ferry there called the “Jubal Early” – a ferry that is still in operation today. I have always loved the nearby Leesburg VA area – I’ve been there many times, most recently this past summer when I spoke to the Leesburg Civil War Roundtable. Whenever I make a visit, in addition to exploring the history of the area and surrounding Loudoun County, I never fail to make a stop at White’s gravesite in Union Cemetery and also at the ford to watch a ferry trip or two. Elijah White, his 35th Battalion Virginia Cavalry, and cavalrymen and “guerillas” of the Loudoun County area have been a special interest of mine for many years. I’m ecstatic that the Authority is able to purchase this land and save it for future generations – it is still pristine and can now remain so. See Paul’s blog post here, including a beautiful photograph of the area. In the March 2009 issue of America’s Civil War magazine will be an article based on the Gettysburg Battlefield Rock Carvings section of the new book by me and Steve Stanley, The Complete Gettysburg Guide. Our new book features about two dozen of all the known rock carvings on the battlefield. Many folks are familiar with the most famous of these carvings, such as the inscription on a boulder atop Little Round Top indicating the rock on which Col. Strong Vincent stood when mortally wounded. However, there are many other carvings (some done by veterans of the battle) not as well known, including some that were made nearly 20 years before the battle. The magazine had chosen about a dozen of the carvings featured in our book. Maps by Steve Stanley accompany the article, and will assist the reader to find the carvings. Just like in the book, GPS coordinates for each carving are also included. Please watch for the article – it will give you a sneak preview of that section of the new book. Over the past several days, I’ve received quite a number of emails from folks asking about specifics regarding the new book, The Complete Gettysburg Guide, by me and cartographer/photographer Steve Stanley. 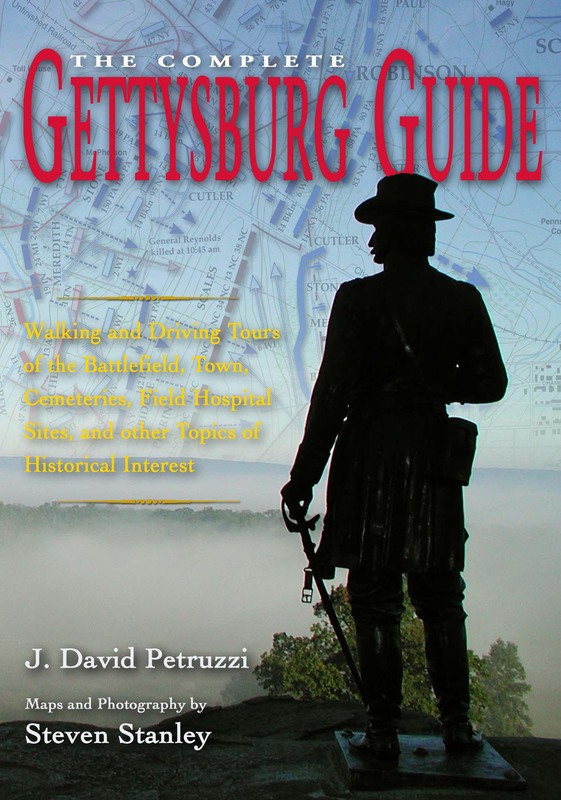 Folks would like to know exactly what tours are in it, what the maps are like, etc., and how the book is different than the legion of other Gettysburg tour books available. The main battlefield tour, broken down by July 1 and then the 2nd and 3rd together, contains details of terrain, farms, troop movements, monuments, trivia, etc. not found in other tours. 70 maps, all in full color by Steve, accompany the tours – and one unique feature is that they (where applicable) also contain the existing Park roads shaded in. This way, you can stand on the ground and see exactly where the troop movements and actions take place around you, even when you don’t have a historical road to pinpoint your location. It’s a fabulous feature. For instance, you can stand along Buford Avenue northwest of town and watch the action of Iverson’s attack unfold in front of you. And for all the tours, Steve has mapped out actions NEVER done before in detail – for instance, the June 26 skirmish at Marsh Creek along the Chambersburg Pike between Gordon’s Brigade/Elijah White’s Cavalry and the 26th PA Militia/Bell’s Adams County Cavalry. The fight at the Witmer Farm is mapped in detail for the first time. The opening skirmishes of the battles of Fairfield and Hunterstown have never been mapped before – but you’ll find them in this book. You will see details mapped of Pickett’s Charge, Barlow’s Knoll, Little Round Top, etc. like they’ve never been done. * A tour of all known rock carvings (some by veterans of the battle) on the battlefield – this is one of the most interesting features to many folks! Global Positioning (GPS) coordinates are also included for rock carvings, hospital sites, sites on the other battlefields, etc., to assist the tourist in finding locations. You can take your GPS device or navigator unit with you, and know that you’re on exactly the right spot. The book is indexed and there’s a complete bibliography of sources. Publisher Ted Savas is producing the book in hardcover that can easily be taken out on the field and in town, and the book is in full color. Dozens of Steve’s beautiful full color photos grace the book. Many, many Park Rangers, Licensed Battlefield Guides, Licensed Town Guides, historians and friends have assisted us to make this book FULL of many things you’ve never known about the battle and the field, and we truly think it will be a journey of discovery to take this book “out there” with you. Well-known and popular Gettysburg National Military Park Ranger Eric Campbell penned the Forward to the book. Eric appreciates the importance of the ground and terrain like no one else, and we are honored that he has given his imprimatur to this work. Click here to go to Amazon’s page for the book. Signed copies, as well as the Special Signed and Numbered Gettysburg Edition (limited to 100 copies with a specially designed book plate by Steve) are available from us once it’s released about May 15. The book is about 320 pages total. As I continue to get specific questions about the book, I’ll post them and explain them here. Then I noticed “M.D.” after his name. Oooo, I thought. A senator and a doctor. Am I being sued? I’ve never been to Texas, so I couldn’t have wrecked into his car or anything. Wait, maybe he was recently here in Pennsylvania. What could I have done? My compliments on your book, One Continuous Fight. I grew up in Martinsburg, W.V. and hunted & fished the Potomac from Williamsport & Shepardstown in the 1960’s. My mother lives in Falling Waters. I attended medical school in Richmond (MCU) & did my Family Medicine residency in Harrisburg, Pa. Needless to say your book hit home. I have read over 100 books on the War. Yours is one of the best. By the way, at MCU one of my attending physicians was Dr. Hunter H. McGuire. It doesn’t get any better than that. All kidding about my college days aside, the letter really made my day once I read it. My co-authors Eric Wittenberg and Mike Nugent feel the same, and our publisher Ted Savas was very impressed. It is the appreciation for your work by your readers that keeps you going. Criticism, too – we learn from both and it makes us better researchers and writers. I wrote Senator Deuell back on behalf of Eric and Mike, and also sent him a special bookplate signed by the three of us to place inside his copy of One Continuous Fight. And I thought it was very interesting that he had practiced with Dr. Hunter McGuire… evidently, medicine still runs in that family! My new book, co-authored by cartographer Steven Stanley, has just been listed on Amazon and is available for pre-order. (Please note, however, if you’d like a signed copy, you need to order from our website once it’s established, or from Savas Beatie directly). The Amazon page will give you details about the book. The release date is May 15, 2009. We really look forward to its release! This really chaps my saddle. I spent the weekend in Gettysburg, not just for Remembrance Day but to do some ground research for a few final touches to the new book by myself and Steve Stanley, The Complete Gettysburg Guide. Sunday morning, I took Steve out the Hanover Road to do a quick interpretation of the July 2, 1863 fight for Brinkerhoff’s Ridge so that he could get some photos. One of the best places to stop there is along Hoffman Road, right in the middle of the battlefield, which affords a vistor a view of most of the terrain. Late on the afternoon of July 2, the second day of the Battle of Gettysburg, the cavalry division of Brig. Gen. David Gregg came onto the right flank of the Federal Army and engaged the Stonewall Brigade of Confederate infantry there along the Hanover Road. The fight, which lasted until dark, pulled the vaunted and experienced Stonewall Brigade out of the Confederate assault on Culp’s Hill, perhaps making a difference in the results. The vortex of the fighting was an old stone wall that lined Hoffman Road (an unnamed road in 1863, more of a glorified farm lane that led to the many properties in that area north of the Hanover Road). Gregg’s men took possession of that stone wall, and there were several Confederate assaults on it. It was a natural breastwork that the Federal troopers took advantage of and were able to hold it until both sides withdrew. There were, however, several consequences of that fight that had great impact on events of the final day, July 3. Earlier in the fighting, newly-arrived Confederate commander Jeb Stuart watched much of the skirmishing. Stuart sized up Gregg’s force, and saw how the area of Cress’ Ridge and the all-important intersection of the Hanover and Low Dutch Roads lent itself to cavalry fighting. Undoubtedly, Stuart used what he saw to make his dispositions and calculations about a possible attack on Gregg the following day. Gregg, in turn, realized the vulnerability of the road intersection – one that led right into the right rear flank of the Federal Army – and that it couldn’t be abandoned at any cost. Many of us know the events of the following day. Just a short distance away, Jeb Stuart battled with Gregg at the same time Pickett’s Charge began to the west. Stuart’s movement back to the area had absolutely nothing to do with Pickett’s Charge (contrary to popular myth about Stuart’s attack being somehow coordinated with the infantry assault), but Stuart felt if he could successfully assail Gregg’s position there, then he could exploit any breakthrough and wreak havoc on the Federal lines of supply and retreat. That old stone wall along Hoffman Road, then, has been all-important to the interpretation of the events of the fighting there on July 2, as well as the grand cavalry action at East Cavalry Field on July 3. Well, yesterday I drove Steve there and turned onto Hoffman Road, intending to show him the stone wall (which had probably stood in that position for nearly or more than 200 years) and interpret the fighting so he could take pictures for the book. As soon as I turned onto the road I got a shock I didn’t expect. The stone wall, which I, Eric Wittenberg, and others who have studied this fighting, and which we use to demonstrate the actions, was completely gone. And I mean gone. Not a single pebble remained. Nothing. The property owner had cleaned up the field east of Hoffman Road (now admittedly affording a better view of the eastern part of the battlefield in that area) but he or she had also completely removed every single stone of the stone wall. As I said, it had likely stood along this road for around 200 years. There are Union trooper accounts of the Federals actually knocking rocks out of the waist-high stone wall in order to shoot through it. That damn wall only stood about 2 feet high in recent years, and only took up about 3 feet of space along the road for a distance of maybe a couple hundred yards – a far cry from what it was 150 years ago, of course – but a tangible representation of what were there and fought over by both sides nonetheless. The Stonewall Brigade made several valiant attempts to capture that wall, and Gregg’s troopers put up a very stubborn stand to protect it – many paying for it with their lives and blood. Now it’s gone. Lord knows where the rocks even are. Of the thousands of stone walls in the area, some original and many not, this one had to be removed. I don’t know if the landowner even realized the significance of the wall. Perhaps not – it’s amazing how many folks you talk to around the battlefield who don’t have a clue that anything happened anywhere near them. I can’t count the times I’ve spoken to landowners who had no idea that something of importance happened on their ground – whether it be an encampment, movement, skirmish, or even full-scale battle. When they don’t know, they certainly have no reason to care. Well, like the plowing under, development, and destruction of so much historic property on and near the battlefield, this is yet one more example. And when I take folks on Hoffman Road to interpret the fighting for them, now I’ll be saying “you have to imagine the stone wall that used to be here.” They can no longer see it, touch it, imagine what the rocks would say if they could speak. Most of those rocks probably fill in some hole somewhere, never to be appreciated as a mute witness to a historic event ever again. Thank you, Progress. That 3 feet of ground the wall took up was, I guess, either too precious to waste (for what, I don’t have a goddamn clue) – or the owner was simply ignorant of what it meant. Either way, we’ve all lost. Yes, yes – I know… “Where have you been, J.D.? ?” I haven’t posted in a couple months simply because I’ve been busy finishing up the new book, and we’ve been very busy at the office. In addition, I’m formatting an entirely new blog on a different host, and will post the link to that once I get it finished. We’re now ready to release the information on the new book – it’s titled “The Complete Gettysburg Guide.” It is co-authored by master cartographer Steven Stanley (those of you who are members of the Civil War Preservation Trust will be familiar with the beautiful full-color maps that Steve does). About 70 of Steve’s full-color maps as well as dozens of color photos are in the book. It’s a larger size, 7×10, entirely in color, hardcover, and over 300 pages. * The main battlefield, all three days – including cavalry actions on the flanks on July 1, initial skirmshing in Pitzer’s Woods on the morning of July 2, and Farnsworth’s Charge on July 3. My tour of the battlefield includes much more ground than even the Park’s driving tour. * July 2 Battle of Hunterstown (much more detailed than the one that appears in the book by Eric Wittenberg and myself, Plenty of Blame to Go Around. In addition, there’s a section called “Gettysburg on the Web” that details many of the best internet websites for the visitor and scholar. And a whole lot more. I’m so pleased that Steven Stanley has graced the book with his maps and photographs – the book is truly a collection of Stanley Gettysburg maps, and all in full color. Publisher Ted Savas has a link on his website to a description of the book, (Update – click here for the Amazon page for the book) which will be available beginning May 15, 2009. Here is a link to a video trailer featuring this and other upcoming titles from Savas. Signed copies will be available, and Steve and I will have a limited number of 100 Special Signed and Numbered Gettysburg Editions available as well. We will shortly have a website dedicated to the book, which will also be interactive. I will release the link here once we have the site set up. I’ve just been notified by our publisher that the second edition of One Contnuous Fight: The Retreat From Gettysburg and the Pursuit of Lee’s Army of Northern Virginia, July 4-14, 1863 is now shipping from the printer – a week earlier than expected. We know that many folks have ordered it from publisher Savas Beatie, Amazon and other sellers – well over half the second edition is sold already – and are waiting patiently for its arrival. You won’t have much longer to wait, and we very much appreciate your patience! Yesterday, I received my copy of the Civil War News, and there is a terrific review of the book in there. Eric, Mike and I very much appreciate it and all the kind words it has garnered. As our publisher Ted Savas posted today, One Continuous Fight: The Retreat From Gettysburg and the Pursuit of Lee’s Army of Northern Virginia, July 4-14, 1863 by Eric Wittenberg, Mike Nugent and myself has just gone into a second edition. 60% of the second print run, as Ted reports, has already been sold through current in-house, Amazon, and other distribution orders. We’ve been very humbled and appreciative of the success and reception of this book. Both the History Book Club and Military Book Club have chosen it as an alternate selection. A few days ago buddy Steve Basic sent me a copy of the club’s newsletters, and there was a great two-page spread on the book in it. It is quite prestigious indeed to be selected by them and we’re very grateful for it. Thanks to everyone again for all the kind words about the book and for the positive reception it has been getting. I have heard from many folks who have taken advantage of the driving tours in the back of the book, and their enjoyment of them has truly been the most rewarding of all.